The Costa Brava is a coastal region of northeastern Catalonia, Spain, in the comarques of Alt Empordà, Baix Empordà and Selva, in the province of Girona. Costa is the Catalan and Spanish word for 'coast', and Brava means 'rugged' or 'wild'. The Costa Brava stretches from Blanes, 60 km (37 mi) northeast of Barcelona, to the French border. Tourism rapidly took over from fishing as the principal business of the area. While part of the Costa Brava coastline lent itself to tourist developments on a very large scale, other parts have retained a more traditional look and have become "hidden gems" for visitors who want a little more than sun, sand and sangria. Small towns like Cadaqués, which is close to the French border and close to the foothills of the Pyrenees, have attracted artists, such as Salvador Dalí, Joan Miró and Pablo Picasso. The Dalí Theatre and Museum in Figueres is one of the most important and visited museums in Catalonia. One can also visit Dalí's House - Museum in Port Lligat, near Cadaqués and the Castle of Púbol in Púbol. The coast between Roses and Tossa de Mar has many delightful small coastal towns, such as Pals, Begur, Tamariu, S'Agaró, Empuriabrava, Llafranc, L'Estartit, Aigua Blava, Fornells, Calella de Palafrugell, Palamós and Sant Feliu de Guíxols. Santa Susanna - a popular international destination. Sports, leisure and relaxation are all possible in Santa Susanna thanks to superb beaches which cover a surface of more than 100,000 square meters. The Aquamarina Hotel is a modern, whitewashed seaside resort complex, located 100 metres from the beach and 54 kilometres from the city of Barcelona. Within the surrounding area are a medieval castle and the Gran Palace, both 10 kilometres away. An assortment of buffet cuisine is available at the main restaurant, and the poolside snack bar is open daily, serving pizza and paella. Live entertainment is also held regularly in the evenings, including live music and flamenco shows, and refreshments and drinks are available at the Tropical Bar and Lobby Bar. Guests can enjoy the hotel's extensive gardens, and relax on sunbeds and parasols around the pool (cushions can be rented). There is a children's pool and mini-club for the kids, while practical amenities include a 24-hour front desk and parking. The Aqua Hotel Montagut is a modern resort hotel set 150 metres from the promenade and beach of Santa Susanna on the Costa Brava. Facilities at this family-friendly hotel include an outdoor pool set in gardens with terraces, parasols and sunbeds, and children have a separate pool. There is a café and snack bar, a satellite television and video room and a games room. The hotel also has an entertainment programme of shows, dancing and contests, and there is a kids' club offering all-day activities. The hotel has a modern buffet-style restaurant serving Spanish and international dishes, as well as vegetarian and children's options. Aqua Hotel Montagut offers 168 air-conditioned guestrooms located on seven floorswhich have smart, modern decor with tiled floors, colourful contemporary furnishings. The Riviera Hotel is located in Santa Susanna on the Costa Brava, Spain, opposite the promenade and 100 metres from the beach. Malgrat train station is 500 metres from the hotel. The interior of the Riviera Hotel features a polished oak floor and reception desk. 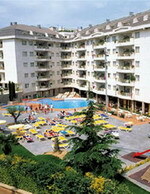 A separate outdoor pool opens for adults and children and during the summer the hotel offers live music and shows. Staff are available around the clock at the front desk to guard guests' valuables in the safe. 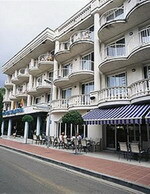 The hotel offers a half-board rate, which includes a buffet breakfast and dinner in the restaurant. The full-board rate includes breakfast, lunch, and dinner. The 250 guestrooms available at Hotel Riviera are decorated in light colours and extend to balconies. The Sant Jordi hotel is located in Santa Susanna, on the Costa Brava, Spain. The beach is 70 metres away, the resort centre is three kilometres away, and Blanes is nine kilometres away. The nearest train station is situated 600 metres from the hotel. Overlooking the beach, the Sant Jordi Hotel occupies a modern property spread over five storeys. The hotel extends to an outdoor pool with separate children's area, and offers a daily animation programme and evening entertainment. Further amenities include complimentary parking and an Internet point. The Sant Jordi Hotel houses a relaxed, modern restaurant serving a range of local and international dishes from an extensive buffet. There is a snack bar, and a complimentary buffet breakfast is provided. The half- board rate includes a buffet dinner and the full-board rate includes a buffet lunch and dinner. Tossa de Mar is a holiday resort located in Catalonia on the Costa Brava, about 103 kilometres north of Barcelona and 100 kilometres south of the French border. It is accessible through Girona airport, some distance north. Tossa de Mar has three main beaches: a) The Tossa Beach (Platja Gran), in front of downtown: This beach is closed off on the west by the medieval castle. It has a length of 380m and a width of 60 m. b) La Mar Menuda, on the other side of the bay. It has all services and facilities, such a sport equipment. Local police patrol the area on bicycles. It has a length of 180m and a width of 20 m. c) El Codolar, behind the walls. 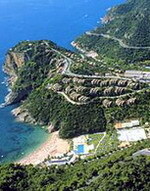 The Giverola Resort is located in Giverola, Spain, four kilometres from Tossa de Mar, 22 kilometres from Blanes, and 42 kilometres from Girona. With direct access via funicular to Giverola cove and the beach, the modern Club Hotel Giverola is housed in a Mediterranean complex surrounded by 170,000 square metres of parkland. The hotel has a gym, indoor pool, and jetted tub, and wireless Internet access is available in the Internet area. 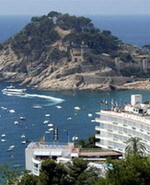 There is a mini-market, and the hotel operates a shuttle bus to Tossa de Mar. 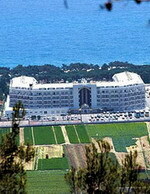 The Club Hotel Giverola houses four restaurants including a seafront Mediterranean restaurant, a self- service restaurant, and a beach snack bar. There is a patio bar, pool bar, and an onsite disco. Breakfast is served every morning (surcharge). The sports area has an outdoor pool with a children's area, a tennis court, and kayaks and canoes for hire. There is a kids' club for 4 to 12 year olds, and an activity and entertainment programme. Further sports facilities include mini-golf, petanque, archery, and table tennis. The 208 apartments have patterned fabrics and wood furnishings, and are decorated in a bright, modern style. The modern four-story Hotel Don Juan is built in traditional style and located in the Costa Blanca resort town of Tossa de Mar, 400 metres from the beach. Set in the gardens, the outdoor swimming pool is surrounded by a sun terrace and features a poolside bar. The Hotel Don Juan provides a programme of entertainment for both children and adults during the summer season. The hotel also offers a billiards table, table tennis and tennis courts. A separate splash pool and a playground are provided for children. Garage parking is available on site (surcharge). The Restaurant Don Juan serves a range of international dishes in a contemporary setting. The 250 guestrooms over four floors feature light decor, contemporary furnishings and sliding glass doors leading to balconies. 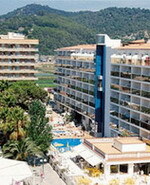 The Reymar Tossa is located in Lloret de Mar, Spain, adjacent to the beach of Mar Menuda, 200 metres from shops and restaurants and six kilometres from Tossa de Mar. The nearest bus stop is 500 metres away. 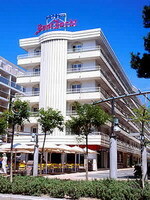 The Reymar Tossa is a modern, five-storey beachfront hotel on the Costa Brava. Amenities include an outdoor swimming pool with sun terrace, children's pool, sauna and gym. The hotel restaurant offers an a la carte menu and buffet-style dining, featuring a variety of Spanish and international dishes, in a relaxed atmosphere with views of the sea. A variety of recreational activities are offered in the vicinity including tennis, miniature golf and water sports. There is a playground for children nearby, and bicycles can be hired for exploring the local area. An entertainment programme is provided in high season and there is an on-site disco. 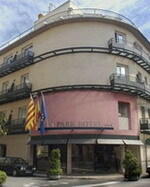 The Park Hotel is located in Tossa de Mar, Spain, in the centre of the town and 250 metres from the beach. This modern, family-friendly hotel features an outdoor pool with paddling area for children, a massage treatment facility, and beauty services. Other amenities include a room service menu, Internet connections (surcharge), laundry facilities, and parking (surcharge). The Park Hotel's Spanish-style Mr Pibb Bar and Restaurant serves international dishes and hosts theme nights. The hotel offers a complimentary hot buffet breakfast daily. Half-board and full-board rates are also available. Business facilities include conference rooms. There is a kids' club at the hotel, and water sports are offered at the nearby beach. There are 71 air-conditioned guestrooms with balconies on four storeys.